Even in sleepy Innsbruck with its fixed book prices, all is not well in any end of publishing. 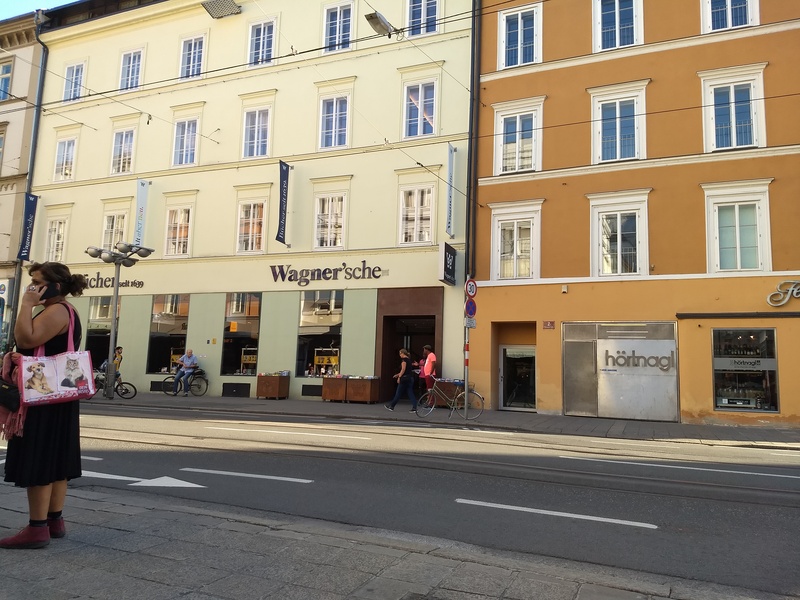 The Wagner’sche in the Museumstraße, Innsbruck (they own the first two storeys of the white building, and the second storey of the brown one). One of my jobs is as a freelance writer, and it is a hard time for us. Advances and royalties are falling, and professional writers in a rich country earn an average of 10k a year from their writing (CAD, USD, GBP, EUR … the currencies vary but the numbers are similar). Elaine Dewar has seen a study that only 7% of the revenues of the Canadian publishing industry are paid to authors; I hope she names it in the print version of ‘The Handover’ and puts it next to how much goes to the publisher and how much to retailers, printers, server farms, and other middlemen and service providers, because another source estimates 10% to the writer, 10% to the publisher, 10% to production, and 70% to various middlemen. Chart writers’ incomes from their writing and you find a hockey stick: the top 5% of authors in the UK earned 42% of the income. If you follow novelists you will hear about the death of short fiction as a paying proposition in the 1970s, the midlist death spiral in the 2000s, or changes in search rules on Amazon or Facebook which devastate creative people’s sales. The central problems are, probably, that they keep inventing other forms of entertainment, and that so many people want to be writers even if the pay is bad. These days if you are interested in history you can watch YouTube or read blogs about books and swords instead of opening a book that someone paid for. (That said, I would really like to see some data on book sales over the last 10 or 20 years … right now all I have is anecdotes). Now, people like Kris Rusch or Dean Wesley Smith will remind you that many writers change pen names as casually as some people change their clothes, and that surveys of writers are often answered by wannabes who do not write, do not finish what they write, do not put it on the market, and do not keep it on the market until someone buys it. If a favourite writer vanishes or only publishes a book now and then, they may well have switched to a new pen name or be spending time writing a different genre. However, I don’t see any reason to think that there were more wannabe writers in 2014 than 2005 to drive down the average income, and pay rates for short fiction have not increased much since the middle of the last century, while the value of a dollar or a pound has collapsed (the Science Fiction Writers of America, for example, count works paid at least 6 cents a word as professionally published … back in 1940 a penny a word was typical, but the penny was worth 17 times more). If rates are falling, clearly writers have to publish more to earn the same. Talking about the publishing recalls the fable of the blind man and the elephant: everyone assumes that their little corner of the industry is the model for the whole. So in this post, I would like to talk about the situation in some kinds of publishing which are not as famous as novels. My friends in tabletop gaming like Steve Jackson Games and Doug Cole tell me that long-term sales have collapsed, and all but a tiny minority of games sell for about two months after release. This makes it even harder to run a games store, because by the time a product has arrived, everyone who wants it probably has it (also, fans often pre-order products through American crowdfunding services rather than at their friendly local game store). In some weeks 80 new board games are released and it would be a full-time job for two teams of workers just to play each of them once. Typical pay rates for freelance RPG writers are 1 to 6 US cents a word (Morrus, What’s a Freelance RPG Writer Worth?). Traditionally, publishing tabletop games required a company with several employees, and so the limiting factor was convincing a group of cynical survivors that your game was one of the rare ones which would make a profit; today, anyone with a dream and determination can publish their own game and lose their own money. Journalism is in a similar crisis which journalists are eager to tell us about. Advertising has moved online, and papers made the questionable decision to make today’s news available for free today, so they publish less and less which is worth reading and more clickbait, ‘sponsored content,’ and opinion. No less than 36 Canadian papers were scheduled for closure in February 2018, and for the whole of Tirol there is one tabloid-style paper but nothing for the city of Innsbruck with 100,000 residents. Last time I was in my home town I noticed that the local alternative paper had switched from gossiping about city politics and small concerts (with the mandatory Dan Savage column and page of escorts’ ads opposite the Save-On Foods coupons) to an ‘arts and life’ paper aimed at the upper middle class with more advertising than content. American newspapers are in trouble too. Publishing seems to be dominated by thin margins and extreme uncertainty about future sales. I would like to read Arthur de Vany’s Hollywood Economics: How Extreme Uncertainty Shapes the Film Industry who argues that film studios have very limited ability to predict how much money a film will make, but just convince themselves that they know secret rules about star power, or hot seasons and genres, or sequels in a franchise. That echoes what I hear from the wisest commentators on the word business like Charlie Stross (“Misconception #1: The publishing industry makes sense”) or Kris Rutsch, and helps to explain why self-publishing can violate every principle in The Weath of Nations and still pay some people better than conventional publishing (having one or two people take on ten or so jobs should be less efficient than a team of specialists who turn manuscripts into books). One of Stross’ key insights is that 20th century publishing was a risk-sharing arrangement: the author got a predictable advance to live on while he or she wrote the book, and the publisher could expect that some books would do better than expected and some would do worse but on average they would earn enough to pay everyone’s salary and keep the presses running. I have two more thoughts about how these changes in different kinds of publishing reflect wider economic and cultural changes. Sam Leith argues that trade publishers have been moving away from clearly written nonfiction on niche topics towards books on ‘big ideas’ by people like Malcolm Gladwell. Doesn’t that remind you of the way oped and “in a twitter post, so-and-so said …” have devoured the news, and of what you read on Medium or in the comments sections of blogs which appeal to people who feel clever and like to talk about ideas? Also, some of the academics I know who publish a lot have a philosophy which is very similar to that of the writers who produce a novel every few months: get it finished, don’t worry too much about improving it before you send it to your editor, publish it and then forget about it while you start your next project. As for me, I think I understand the rules of the game well enough to make decisions and keep learning (even if keeping the mindset for academic publishing and the mindset for commercial publishing apart is difficult; I signed a contract for one forthcoming academic publication which the writer in me wanted to douse with Greek fire while chanting rites of cleansing). What I do not know is how to find more venues for the kind of nonfiction I want to write, whether there is enough money to be worth self-publishing them, and how to let specialized communities which I don’t visit face-to-face very often know that I have something for them. Letting the right people know that your work exists seems to be the hardest problem in publishing: I do not understand why publishers spend a thousand hours getting a book ready for print but do not spend an hour announcing it to the right mailing lists, forums, and facebook groups. I would like to write some things for thoughtful makers which put information from documents and archaeological reports in one place in plain English, and the people who write books like that tend to be “one-book writers” who don’t talk much about the writing business. Like most trades, the first book you make pays poorly- you are still learning to work efficiently and people who like it do not have anything else by you to buy- but after half a dozen the wage can be reasonable. Edit 2019-01-15: See also John Scalzi, Author Incomes: Not Great, Now or Then, 2019.01.07 “The latest Authors Guild survey, which shows that the median income for all authors (from their books) is $6,080, while the median income for full-time authors is $20,300. That $6k median figure is down significantly from previous years…. The Authors Guild’s problem here appears to be one of survivorship bias, namely, that the authors its execs can name off the top of their head as being writers making a living “just writing” in the 20th Century are the ones that are the literary equivalent of the one tenth of the one percent. When you’re reaching for a name of a “middle-class living” writer and you pick a Nobel Prize winner, you’re not exactly bolstering your argument. … As a contrast, the Bureau of Labor Statistics notes that in the United States, the 2017 median income for its category of “writers and authors” was $61,820 annually, with 131,200 jobs in the category (which excludes PR specialists and technical writers, but does include people who write PR and offer technical consulting, so go figure).” So the BLS figure is three times what the Authors’ Guild gives, and much closer to what the people churning our 4-6 novels a year for 20 years say they are earning.